Monday will start off breezy-but-sunny, however the clear skies will give way to what could be strong afternoon thunderstorms. Also, forecasters said, a rip current advisory has been posted for local beaches. The thunderstorms are expected to roll through the Shore area at 4 p.m. or later, according to the National Weather Service. There is a 30 percent chance of precipitation since thunderstorms will be scattered, but areas in the path of the line of storms could see heavy rains that could produce flooding. It will also be windy Monday, with winds 16-23 m.p.h. 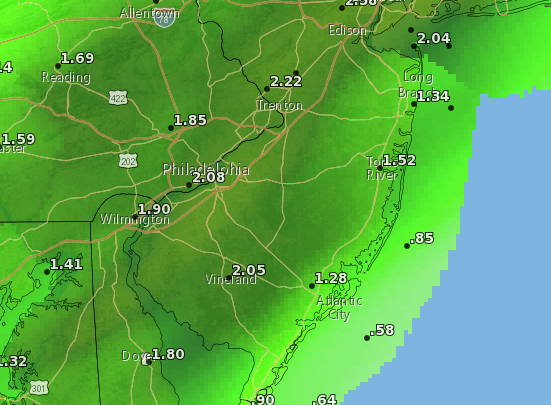 An inch-and-a-half of rain could fall in some locales before the storms move out. The surf will be running high Monday with wave heights 4-6 feet, the NWS said, leading officials to issue a rip current warning. The risk of rip currents is “high” Monday, and the risk will run all day long and into the evening. The thunderstorms that approach during the afternoon could become more widespread in the evening hours, including the overnight hours, the NWS forecast said. “Some storms could be severe, with gusty winds and heavy rain,” the forecast stated. On Tuesday, the NWS is calling for a chance of showers before noon, then a slight chance of thunderstorms between noon and 1 p.m. Otherwise, Ppartly sunny, with a high near 80. Southwest wind 9 to 11 mph. Chance of precipitation is 30 percent. The remainder of the week is forecast to be mostly sunny with highs near 80 degrees.